Hmm... nice idea for a first wall, but a bunch of items to look at. Allow me to constructively criticize/suggest things! Iria literally looks like she's standing on the edge of the paper. Floating there, like she's not a PART of it. Make her a part of the background, build a real picture. For instance, the tree looks like it's panned up. I mean, it's the top of it, you don't see the bottom. So Iria is out of the picture, and apparently floating in the sky! >_< Put them on the level, and remember, scaling! You can have a smaller tree, just put it behind her. Show some ground for a point of reference. Or have the tree bigger, and Iria in the background. Some sort of depth will help! The colors... I like how the red looks. Like there's a fire over the horizon or something. But... I don't think that's what you had in mind. Maybe? The red, with the blue and purple, just seems to be mixed together for the fun of it. Colors as a BG is fine, but it looks like you tried creating a scene, for which it doesn't fit. You've really got the right idea, the BG looks great! seriously! the colors are very vivid and the elements make it look awesome just on it's own but you need to work on how you combine images. Like Shkira said Iria doesn't look like part of the wall. The image doesn't seem the best quality and you could work on your extraction. 1. If you're doing an artsy wallpaper, making a blurred "glow" layer around a character helps hide extraction imperfections. 2. If you're doing something more scenic where there character has to look like a part of the wall, try using the Burn tool on the edges. 3. Don't EVER enlarge an image when making a wallpaper. Enlarged images either result in blurry or poor detail or pixelation. Or too blurry when you try to clean up the pixelation - if you want to enlarge an image look at working with vectoring with the pen tool. There is nothing wrong with a "plain" wallpaper. Some people like them simple. In fact there's a group called "Simple-ism" that supports simple walls. 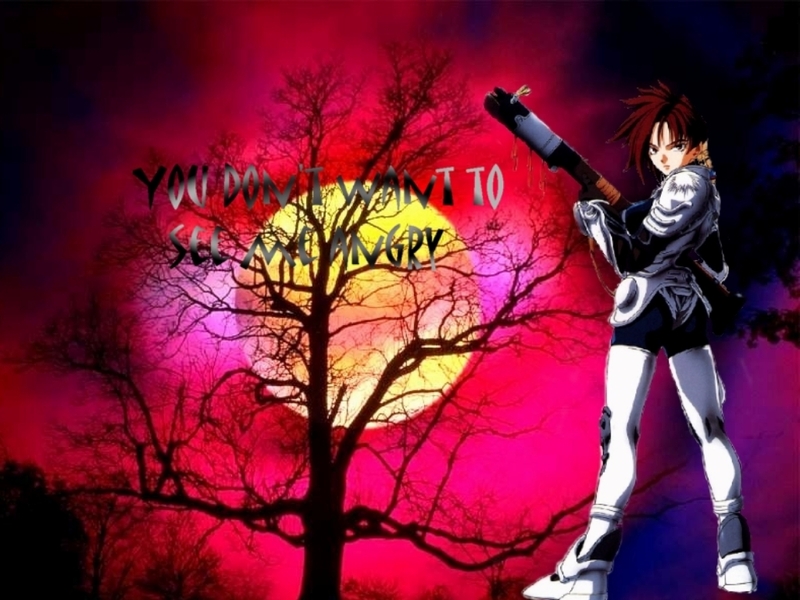 To keep the BG as it is, I would personally enlarge Iria, vector her and have her in the wall from the torso up. Also, don't make text a focus. If you want to have text in your wall, keep it simple and have it blend in with the wall either with transparency or outlininging it with a color in the wallpaper. I see that this is a scenic, so have a look at her feet. I think it'd work nicer witha ground, and plus, don't forget that there's the taskbar on the desktop :) Try to move your characters up a bit (unless their bodies are cut off) so that you can get the maximum amount of charater in a wall. So now that you're a member, do visit our group page. You'll find the link on your joined groups section on your userpage or you can click below on either UA admin's signature to get there. I have written some tutorials and tehre are those fortnightly competitions you may be interested in, because it will no doubt help you improve and give you inspiration for walling.